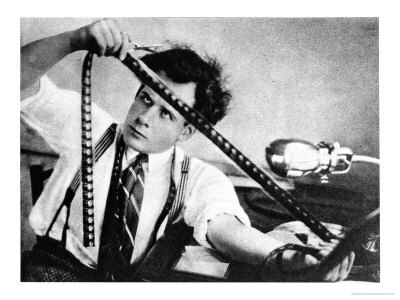 Sergei Eisenstein, that giant of classical Soviet Cinema, wrote and taught extensively on the concept of overtonal montage in cinema. He wrote before computers, the web, and multiple forms of information rushing in all at once were the norm. I often wonder what he would have made of 21st century life: the cacophony of the world we all live and walk through every day — sounds and images, multiple voices, multiple tracks — all enriching, intensifying and sometimes assaulting our senses and our experience of the world. We are often distracted by this barrage. Eisenstein certainly did not associate his notion of overtonal montage with distraction; just the opposite. He wanted the multiple layers to help us see and hear more, not less. More focus, More clarity. His dense images/frames were to help us see those things that normally fall between the cracks into the huge valley of unseeing. I like to think about overtonal montage as way into the layering that is so crucial in approaching things from a material culture perspective. The more questions we ask, the more layers of meaning we reveal, the richer our understanding becomes. Sometimes this hits me in amazing ways on Wednesday nights at our seminar series. I often arrive for a lecture, maybe even on a topic I have never thought about, and find before the conversation has ended, new doors have opened. Sometimes it’s a new methodology; sometimes a new take on some old idea. These Tuesday and Wednesday nights at the BGC provide so much nourishment! Eisenstein would have felt right at home.